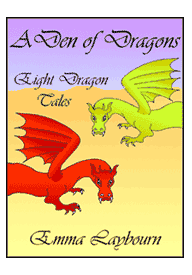 WORDHOARD: a free, printable online dragon story for older children, only at Megamouse Books. Outside the Great Hall, the wind howled angrily as it reeled through the dark. Inside, the villagers huddled together around the central fire. They had glowing red faces and chilly backs. Shadows shook wildly in the corners, as if tossed around by the wind that wriggled under the door. The villagers were tired. Their cows were milked, their horses stabled, their pigs were fed, and so were their children, sitting at their parents' knees. Now all faces turned expectantly towards old Harold. He cleared his throat. Children hushed their parents into silence. They were waiting for the story. "Harumph," said Harold. "Is everybody ready? Now then. Once upon a time, on a dark and windy night just like this-"
"Once upon a dark night there were three goats. No, that's not it. Three - brothers... No, just a minute. Let me try again." The crowd sighed and shuffled a little, very politely. "Once upon a time in a tall castle lived a..."
The old man's voice tailed away. "A something," he said. "Sorry; it's gone. You try, Alfred." The even older man sitting next to him cleared his throat. "One fine day, whilst walking through the forest, a little girl met a-"
"Lost it," he mumbled. "Anyone here remember?" The crowd sighed again, like the mournful wind in the trees, and shook their heads. "You have a go, Hilda," Alfred urged. "You knew thousands of stories once." The oldest woman of all screwed up her eyes and mouth in intense concentration. "Let me see. Let me see. Wait - I think I've got it." "A little girl in a red coat," announced Hilda. "Or was it a hat? Anyway. She was walking through the forest with her axe one day when all of a sudden she came across a great... big... "
"Frog," said Hilda doubtfully. "Perhaps." A soft moan of disappointment wafted around the hall. "Never mind," old Harold said unhappily. "Another night, we'll try again." The people slowly got up, one by one, and trailed out of the hall and back to their dark houses. They were moping and miserable. It was months now since they'd had a proper story. For the tales had simply vanished. Not all at once, but bit by bit, they'd gradually slipped away. Nobody knew where they had gone, or how to bring them back. And if not even Hilda could remember stories any more, what hope was there for anyone else? Most miserable of all was Edgar; for he had the most need of the stories. Edgar was twelve. He lived in the smallest, darkest house in the village, with a neighbour he had to call Uncle, because his parents had been eaten by wolves. Edgar was made to work harder than anyone in the village, because Uncle was lazy; and he received no reward for his labours, since Uncle pretended to be poor, though he was not. So Edgar used to lie in bed at night and tell himself stories until the hardships of the day seemed distant and unreal. But now he had nothing to tell. The stories had faded like dreams, leaving only a few half-remembered images behind. That night, as Edgar shivered in his narrow, lumpy bed, he tried yet again to catch a thread of story and reel it in. Something about a man on a horse - but as soon as he tried to grasp at it, it slipped away again. Edgar groaned. With no story to distract him, all he could think about was the cold. The icy wind squeezed through the cracked window and slid under his thin blanket like a frozen knife. "Why does nobody do anything about it? I can't sleep anyway. I'm going to look for those stories." Jumping out of bed, he dressed, shivering, in his ragged clothes. Then he tiptoed past the room where his bogus aunt and uncle lay snoring, and slipped out of the house. The street was soaked in moonlight and patched with black moonshadows that lounged against each building. Turning to face the moon, Edgar followed it out of the village and across the fields. He crunched across the stubble fields and plunged into the pasture. The long grass soaked his legs with dew. At the far side, he looked back at the trail he had left, grey and glimmering in the moonlight. Next there was a deep, swirling river to cross. It was treacherous enough by day. But the moon shimmered on the water, speckling it with silver; so he waded up to his armpits and pushed against the heavy swell. Breathless, he pulled himself up onto the far bank. By now, he badly wanted to lie down, but knew he must keep moving to stay warm. So he dived into the wood, where the moon winked down beneath the branches. His feet made a great stir in the carpet of dead leaves. Small rustlings answered them like tiny echoes. Boughs creaked far above him. At last he came out of the wood and found himself beneath a cliff. At that point, Edgar's courage nearly failed. But the moon shone down and pointed out the footholds. So up he clambered to a rocky ledge where he stopped, panting, until he realised that the breathing he could hear was not his own. The rock face was dark with more than shadow. He stood at the mouth of a cave, too deep for the moon to reach. Leaning in, and listened. Something in there was snoring like a thousand Uncles. It rasped and growled and whistled; and it sounded very big. But underneath the snores, Edgar heard a faint, sad, hopeless sound: a whimpering murmur. So he clenched his remaining courage in his fists and walked into the cave. He felt his way along the damp wall, testing each careful footstep. The cave went far, far back into the dark heart of the mountain. Something glimmered red, deep in the blackness. At first he thought it was a trick of his eyes; but it grew stronger, turning from a glimmer to a glow. Rounding a corner in the rock, Edgar blinked, bewildered. It was the strangest thing he'd ever seen. Not a snake, though it was scaly: not a lizard, for it had wings like a bat; but it was certainly not a bat either. In any case, it was far too big to be any of these, and it glowed as red as a hot coal. Simon considered all the dangerous animals that he knew. Bull or bear, wolf or wildcat: it was none of these. In any case, it was asleep. Around its flanks crawled feeble little creatures, murmuring. They were like nothing that he knew of either, with their many wobbly legs and bulging eyes. Kneeling, Edgar bent his head to catch their whispers. "...and with a wave of the magic pipe and a one two three! the golden chains fell from her feet..."
"...then the donkey opened its wide mouth and began to sing..."
"...but hiding in his barrel, the cabin boy trembled to hear the captain's cruel words..."
"...and so she let down her long chestnut hair to the fox waiting eagerly below..."
Edgar grinned. Here were the stories he'd been searching for, in a rustling, quivering pile, ready for the taking. He pulled off his shirt, still wet from the river, and knotted the sleeves together around the collar to make a sack. He scooped up handfuls of wriggling, whispering stories and tipped them in. Then, sidling past the huge scaly creature - which still snored unperturbed - he made his way back along the rock wall out of the cave. The journey home seemed much longer than the way there. To climb back down the cliff, Edgar had to grip his shirt between his teeth. The cloth snagged on a stone and a story tumbled out. Immediately, clinging to an outcrop beyond his reach, it began to mutter about the giant troll disguised inside a cliff-face, ready to lure unwary travellers into his gaping mouth. Edgar scrambled down in a great hurry to reach the shelter of the wood. More stories escaped from his torn shirt, rolling away to hide in the dead leaves. From there, unseen, their soft voices told him of the trees that made cages of their branches to catch their dinner in: of bad-tempered goblins who lived in rotting trunks, and wolves visible only by the light of the full moon. Glancing at the milky moonlight, Edgar hurried on as fast as he could. As he waded across a river, another story fell out of his shirt. He heard it float downstream, sighing over the river god who fell in love with the land and flooded it for a year and a day. On the far bank, when he halted to retie the knots, out slid yet more stories, fleeing from his fingers with soft mumblings about unicorns and lions. Even so, there were still plenty left when he set off across the pasture. He listened to their whispers as he walked. They told him how the moon was a lantern lit by a goddess; and it was the ghost of a dead star that had lost its way: and a white boat towed by butterflies: and a cheese kicked up into the sky by an angry cow. They told him how the field he crossed had been won by a farmer in a game of riddles with a giant. They even told him how the trail through the wet grass had been made by goblins on their way to midnight market. By the time Edgar reached the village, his head was spinning. He set the tattered shirt down in the road, untied the sleeves and watched the stories hop and roll and creep away towards the silent houses. Then he trudged back to Uncle's house and threw himself, exhausted, on his bed. One story must have lingered in his pocket. As he dozed, it whispered softly. It told him of the ragged orphan boy who found a terrible dragon that lived inside the mountain, guarding its stolen treasure of hope and joy. Armed with his new-found wealth, the boy left his cruel master (who begged him on his knees to stay) and set out into the world to seek adventure. As the tale unfurled in Edgar's head, he forgot his tiredness, cold and hunger. Deep inside the mountain, the dragon smiled in its sleep.